It's all for you! All your wishes for the best day ever are packed into this radiant bouquet. 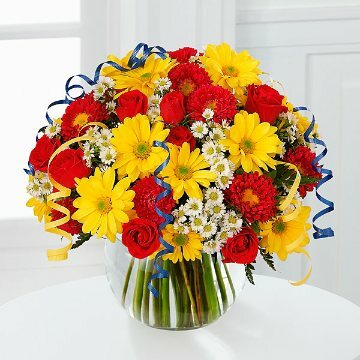 Bright red roses and Matsumoto asters contrast with sunny yellow daisies and white Monte Casino. Curling ribbon adds a festive finishing touch. Standard bouquet is approximately 11"H x 11"W.
Deluxe bouquet is approximately 12"H x 12"W.
Premium bouquet is approximately 14"H x 14"W.